This two can, 3kg all malt beer kit produces a smooth, easy drinking, malty Golden Ale. It comes with a sachet of dried hop powder so that you can adjust the bitterness to your taste. 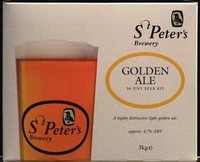 Made by the St Peters Brewery Co from Bungay in Suffolk, with Suffolk barley, this kit allows you to enjoy the unique taste of their ales.